Club Penguin Cheats by Mimo777 Club Penguin Cheats by Mimo777: Club Penguin Puffle Clock! Hey all! 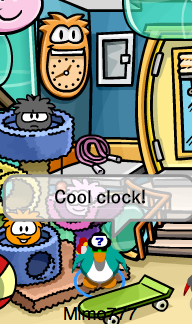 Have you seen this sweet clock in the Club Penguin Pet Shop? Many of you have wondered if this will soon be an igloo item. But, did you know it's not the first clock of it's kind? hey idk where to say this but when you go on stampbook and ur not a member itll say wheres my book cover and the get membership button will be faulty and go fast in loads of languges also u cannot click x.
awesome. but there needs to be more clocks. lol. That was the lodge attic, when you needed to find the pieces for the Find Four game. I remember I wanted the penguin clock for my REAL bedroom. Still wish I could have it. In turquoise. Woah! That's soo cool!! I hope it does come out as furniture! Yeah. I thought that clock looked familer (yes. I know I spelled it wrong). Thanks for reminding me. 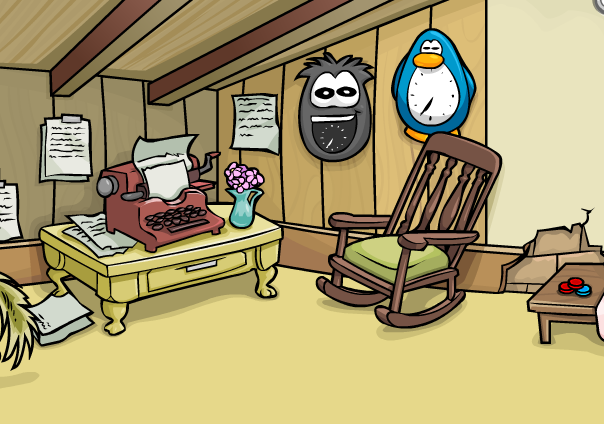 It would be cool if it was an igloo furniture item. This is off topic but... Didn't you say something about wigs for nonmembers a long time ago? yeah! id like a puffle clock but did you know their was one before a couple of years ago? Has anyone noticed there hasn't been a St. Patrick's Day party? if you see this mimo777 then can you start a protest to cp? mimo i said that along time ago! Mimo! There's A New Message For Epf Agents! URGENT: new message has been sent to EPF agents from the protobots. hey mimo! i just finished getting all the cannon parts in the 1st level of puffle launch! when you get all the parts you get a free cannon to put in your igloo that lets you play puffle launch from your igloo! how cool!